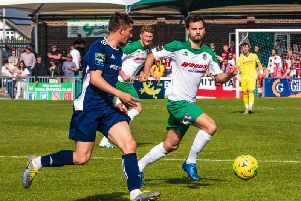 BOGNOR have missed out on a fourth Sussex Senior Cup final in seven seasons - losing a close-fought semi-final 3-2 after extra time to Eastbourne Borough. Jamie Howell’s FA Trophy heroes fought back after conceding two first-half goals to be level at half-time. There was little between the sides after that but Borough won through to May’s Amex Stadium final against Worthing Rebels with an extra-time header by Elliott Romain, who was later sent off. It was tough on Bognor, who battled well against another set of National League South opponents. But at least they still have two big competitions to focus on - the Trophy and the Ryman premier promotion race. This was Bognor’s third county cup semi-final in four seasons and they had won both the previous two, in 2013 and 2014, before losing in the final on each occasion. This was also Bognor’s first semi-final tie of three in 18 days, with two legs of the FA Trophy semi-final to come against Grimsby on March 12 and 19. There was only one change to the starting line-up, with Stuart Green coming in for Saturday’s goal hero Snorre Nilsen. Grant Smith had a couple of nervous moments in the opening couple of minutes, taking a little long to clear after a backpass and then fumbling a cross before gathering at the second attempt. Ollie Pearce led a quick break in the seventh minute but his attempt to square to the unmarked Green was thwarted by a defender’s block. But it was Eastbourne who took the lead in the ninth minute as Jamie Taylor seized on a loose pass out from the back by Bognor, took a touch then arrowed a low drive from the corner of the area beyond Smith’s dive. The Rocks should have been level straight away but Ollie Pearce contrived to divert a low ball into the box way over the bar with an open goal yards in front of him. Jason Prior rose well to meet an Alex Parsons cross on 13 minutes but his header was too high. But it was a spirited response to going behind by Howell’s team. Taylor almost doubled his tally for Borough on 17 minutes, striking a snap-shot narrowly wide after Darren Lok knocked a cross down for him 12 yards out. It was 2-0 in the 24th minute when Nat Pinney glanced a header beyond Smith following a pinpoint cross from the right by Ryan Wo. Another Eastbourne attack led by right-back Jake Sheppard almost brought a third - as did the resultant corner, headed just over by Lok. Parsons was probably Bognor’s most influential player in what had been a difficult first half, swinging over a number of good crosses, and one was perfect for Prior at the far post - but he headed it down into the ground and wide. Suddenly, on 32 minutes, the Rocks found the goal they desperately needed to get back into it, Green finishing superbly with a right-foot shot after Pearce got to the byline and pulled it back into his path on the edge of the area. Pearce had half a chance to make it 2-2 on 38 minutes but couldn’t get any power on a header as he ran on to a bouncing ball in from Parsons. But it was 2-2 a minute later. A Rocks attack looked to have broken down but they won back possession and another cross from the right found Prior as a defender failed to head clear. The skipper took one touch then curled a lovely shot around Borough keeper Lewis Carey and into the top corner. Bognor started the second half well and Parsons saw a high cross from the right bounce off the crossbar. Another Parsons cross a minute later was just too far in front of Green as he ran in to try to tuck it away at the far post. It was all Bognor at the start of the half and cross after cross was going into the Borough box, but their defence were digging in well to cope with them. Eastbourne relieved the pressure with a break that led to a corner from which Craig Stone had sight of goal at the back post, only for two defenders to combine to block it. Borough were close to regaining the lead on 66 minutes when Sam Beale burst into the box down the left. It eventually fell to Sheppard eight yards out and his low drive was blocked on the line. Alfie Rutherford replaced Prior at the second half’s midway point. Prior had fallen heavily when defending a corner, apparently after getting a boot in the back. He needed treatment, probably causing alarm among Bognor fans who wouldn’t want to see their talisman miss games through injury, but he did appear to recover before coming off as a precaution. Eastbourne made a change with forward Gavin McCallum coming on for defender Callum Buckley. The match fell a little flat with neither side finding the sort of energy they had each enjoyed for spells in the first half. But Bognor were still doing their share of attacking and Dan Beck flashed a 25-yard shot wide. Yet another Parsons cross was right on Pearce’s head and his goalbound effort was superbly tipped over by Carey. The corner - by Pearce - was met by the unmarked Robson but his bullet header was the wrong side of the post. Borough’s Nathan Collier was booked for a foul committed in the build-up to those two Rocks chances. Another Eastbourne change saw Romain replace Lok. Bognor went close to a late winner three times in one 86th-minute spell of pressure. Green forced Carey into a diving save and the keeper then tipped Parsons’ follow-up over - the corner was met by Robson and his header was going in until a defender headed it up and against his own bar and out to safety. Davies saved Bognor at the death by getting a toe on a dangerous ball across the face of goal to concede a corner. Romain ought to have won it for Borough in the final minute when he found himself with the ball at his feet and only Smith to beat - but the keeper came out to divert it for a corner. McCallum went down in the area and Borough were demanding a penalty but it was not given. The goalless second half meant extra-time - hardly something to be welcomed by the Rocks as they gear up for another eight games this month. Nilsen replaced Green for the start of extra-time. Davies almost caught out Carey in the first minute of the extra 30 with a curling shot from 25 yards that was not far off target. McCallum cut inside from the right and shot low towards the bottom corner but Smith got down to palm it away for a corner. Eastbourne retook the lead in the 12th minute of extra time. The Rocks felt they should have had a free-kick for a foul on Smith at a corner - it was not given and from the next corner, Romain headed home. Davies and Romain were booked for some off-the-ball handbags. Bognor looked a little flat for a while after the goal and they made their final substitution at the start of the second period of extra time, while Borough brought on Ian Simpemba for Worrall. Pinney was booked for time-wasting as Borough started trying to play the game out. Pearce thundered a free-kick goalwards but it was too high. For Borough, Pinney wasn’t too far off the mark with an ambitious shot from nearly 30 yards. Davies was equally ambitious, and equally out of luck, with a long-range effort on Carey’s goal. Romain was shown a second yellow, and a red, for raising his arm against Davies as the defender tried to get the ball off him by the corner flag. It was a needless sending-off for the goalscorer but his team-mates did not have long to hang on without him. In the final minute, Beck was booked for dissent when he complained about the award of a soft free-kick given just outside the Bognor D.
A late free kick for a foul on Field was Bognor’s last chance but despite Smith going up for it, they couldn’t find an equaliser. It leaves Bognor with the not-inconsiderable twin aims of further FA Trophy progress and promotion from the Ryman premier. Rocks: Smith,Davies, Crane, Tuck, El-Abd, Robson, Green, Beck, Prior, Pearce, Parsons. Subs: Nilsen, Field, Rutherford, Wollers. Eastbourne: Carey, Sheppard, Beale, Stone, Hamilton, Buckley, Worrall, Collier, Pinney, Taylor, Lok.Subs: Bosma, Khinda-John, McCallum, Simpemba, Romain.